This is a bridge short story between the first and second part, written by involving the fans of Lockwood & Co. 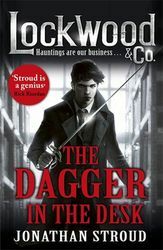 The story was created for Halloween of 2013, when the author asked the fans of The Screaming Staircase for all the details, for example the younger fans decided that the story should take place in a school… Accordingly a customer asked Lockwood & Co to investigate a mysterious dagger in a desk in St Simeon’s Academy for Talented Youngsters. They prepared for hunting and went to the school, and the whole, short story is about this not particularly exiting hunting. But the story is written in the same mood and delivers the same amount of fun as the books, and it’s great to meet again with the guys until Book #3 will be published. At the end of the story there is an encyclopedia about the types of the ghosts, and it was illustrated with scary pictures (you can see the pictures on the Guardian website as well). Penguin Random House UK Children’s, 2013.